Nine SA Navy protection branch members recently honed their shooting skills as part of a harbour patrol boat (HPB) learning opportunity. The exercise was, overseen by an SAS Simonsberg instructor, took place at the Lower North Battery and saw the nine using 7,62mm calibre SS77 light machine guns and 12,7 Browning machine guns. The shooting exercise was a practical evaluation as part of protection branch learning outcomes. This includes, among others, acquiring and putting into practice the skills needed to operate an HPB, man and operate all weapons and pyrotechnics on an HPB, operate the boat’s radar and radio equipment and execute operational doctrine as crew aboard an operational HPB. The shooting exercise was their first exposure to HPB, also known as Namacurra, operations and weaponry. The Navy learners who did the shooting exercise are from shore-based units working in the maritime service’s protection branch. Their responsibilities include access control to naval units and bases as well as harbour protection. 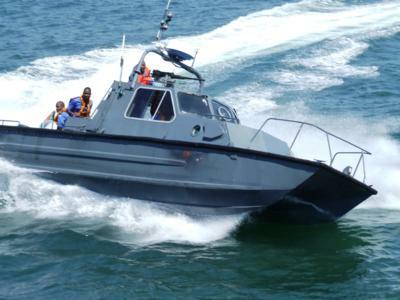 SAS Simonsberg is an SA Navy training unit specialises in gunnery, anti-submarine warfare, communications and seamanship. The exercise was done at the Lower North Battery is the oldest, still armed fortification in South Africa. Previously known as the Zoutman Battery it was designed by Thibault in 1793. It is used by the Navy for training in the use of various calibre weapons throughout the year, with the exception of peak whale mating season – mid-August to mid-November. To ensure protection for whales sentries with cameras are deployed on high vantage points. If any whales are spotted firing immediately ceases until an all-clear when whales leave the range boundaries. The Lower North Battery is also used for ceremonial gun salutes for visiting ships.